At Whitsun this year, every farmer, gardener and friend of biodynamic farming – wherever they were in the world – was invited to participate in the first ever World Biodynamic Farming Day. The event commemorated the date in 1924 when Rudolf Steiner began the lecture series which gave birth to the biodynamic agriculture movement. The moment was marked by a simultaneous application of the two biodynamic sprays, or preparations, at the same local time all over the world. Limeburn Hill Vineyard took part, spraying Horn Manure as the sun was setting on Saturday June 3 and Horn Silica as the sun was rising the next morning. The action symbolised a reconnection to a collective memory that agriculture is intimately intertwined with the earth’s daily and seasonal rhythms which are in turn influenced by planetary forces. Steiner’s preparations were designed to respond to and amplify those energies to enrich life in the soil and improve plant growth. For each preparation he combined a natural material with a sensitive receptacle. 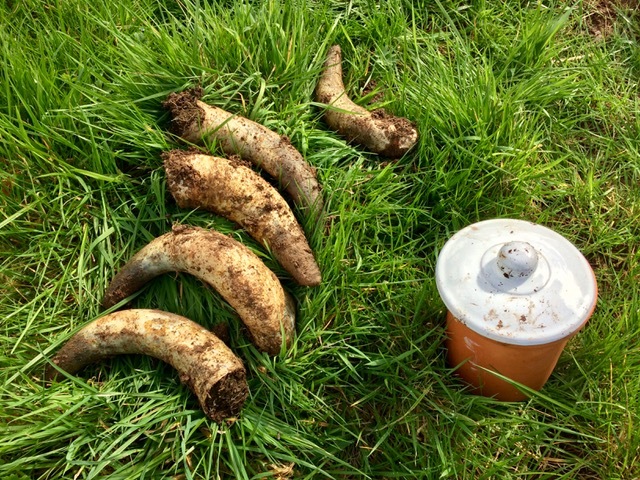 BD 500, or Horn Manure, is made by filling a cow’s horn with fresh cow manure and burying it overwinter between the equinoxes. This is earth’s quiet time when it draws in and conserves energy, allowing a slow fermentation of the manure into sweet-smelling humus, rich with micro-organisms. When diluted in water and sprayed in large droplets on the soil, it increases mycorrhizal fungi which help plant roots absorb nutrients and attracts earthworm activity which improves soil structure. This year we made our own preparation using manure from a neighbouring organic farmer. BD501, or Horn Silica is crushed quartz buried in a cow’s horn between the spring and autumn equinox when the earth is warmed by the sun and exhaling its energies in the form of dynamic growth. It is applied as a fine mist directly on the leaves which promotes photosynthesis. The effect can be actively seen in the lift of the foliage towards the sun, while tiny crystal particles bounce light around the canopy. The beginning and end of the day are a special time to be in the vineyard. The action of walking and spraying brings a physical connection with the soil and the vines, while the calmness and quietness allows for a profound awareness of the natural world. It was humbling to imagine those feelings being multiplied across the planet for day.